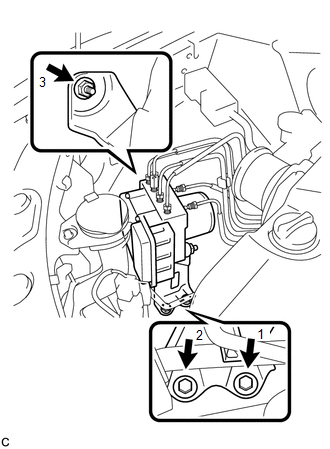 (a) Install the brake actuator assembly to the brake actuator bracket assembly with the 2 nuts. 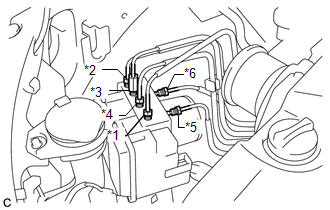 Do not remove the hole plugs of a new brake actuator before connecting the 6 brake lines because the brake actuator is filled with brake fluid. 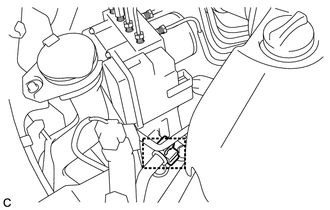 Do not hold the actuator by the connector. Set the actuator down with the pin being set securely as shown in the illustration. 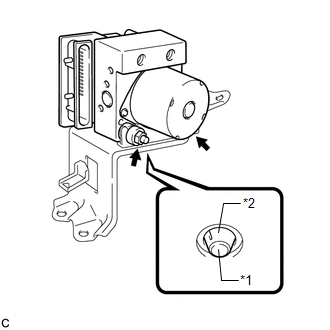 (a) Install the brake actuator with bracket to the body with the nut and 2 bolts. Do not damage the brake lines or wire harness. Tighten the nut and 2 bolts in order from 1 to 3. (b) Connect the brake actuator connector. Make sure that the connector is locked securely. Make sure that the actuator connector can be connected smoothly. Do not allow water, oil or dirt to enter. 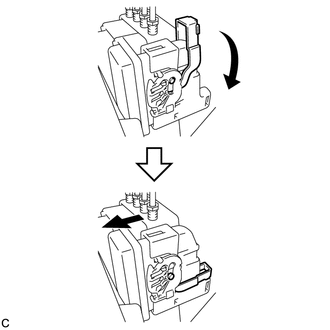 (c) Temporarily tighten each brake line to the correct positions of the brake actuator with bracket as shown in the illustration. (d) Using a union nut wrench, fully tighten 4 brake lines (A). 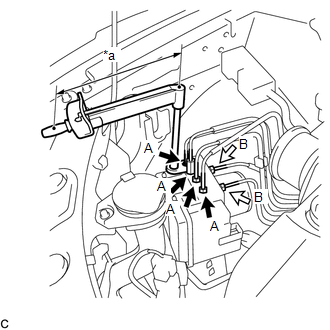 (e) Using a union nut wrench, fully tighten 2 brake lines (B). 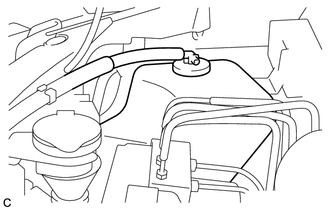 (f) Install the clamp of the suction hose sub-assembly to the brake actuator bracket assembly. (a) Install the radiator reserve tank assembly. (b) Install the radiator reserve tank cap assembly.